This 10 minute King and Queen tour takes you around two of Atlanta's most recognizable buildings. The white arches at the top were built to resemble king and queen chess pieces. These structures are even more impressive than you've ever imagined when seen up close. At night they illuminate the Atlanta skyline that we all know and love. 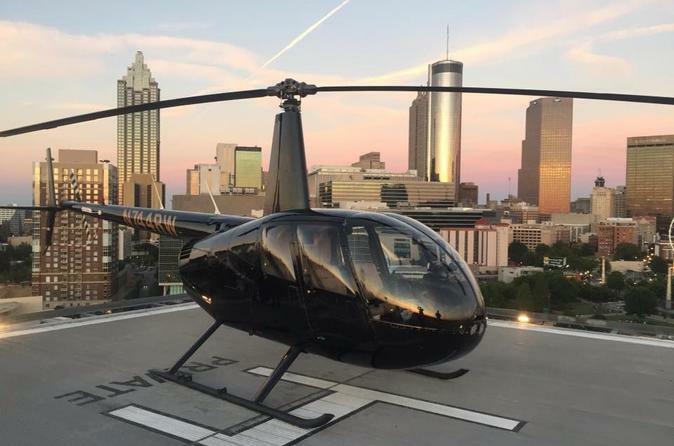 This Helicopter Tour is a great way to get a flight experience in Atlanta without breaking the bank. Arrive at Peachtree Dekalb Airport 10-15 minutes prior to your scheduled departure time. There is plenty of free parking. Your pilot will greet you in the Signature Flight Support Building. There is a short walk out to the helicopter. All passengers enjoy a window seat that allows them to clearly enjoy all of the sites. While you fly at just 600 feet, your pilot will explain what you are seeing from the air in detail. The highlight of the tour is a banking turn that circles the King and Queen Building. You feel as though you can reach out and touch the tops of the buildings as you circle right along side of them. As you make your return to the airport, look south and see the beautiful Downtown Atlanta Skyline to the south. Look around below you, Did you have any idea how many golf courses are in the metropolitan area?! Enjoy a slow decent back into PDK. And because all of our pilots are experienced professionals, relax and notice how soft the landing is!